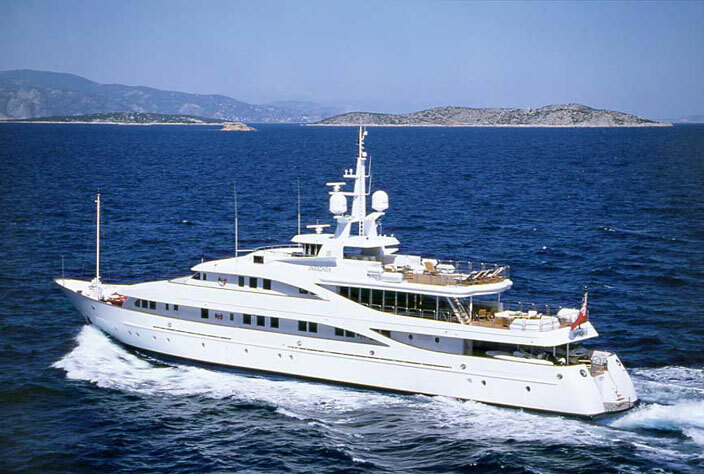 INSIGNIA (ex Hanse) is a 55m (182' 1") luxury yacht which was built in Germany in 1979 and underwent a full exterior and interior refit from a bare hull in 2002/2003. 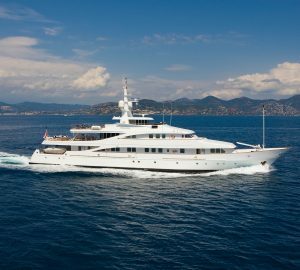 Her last refit was completed in 2017 and included a full exterior paint job and decks replacement. 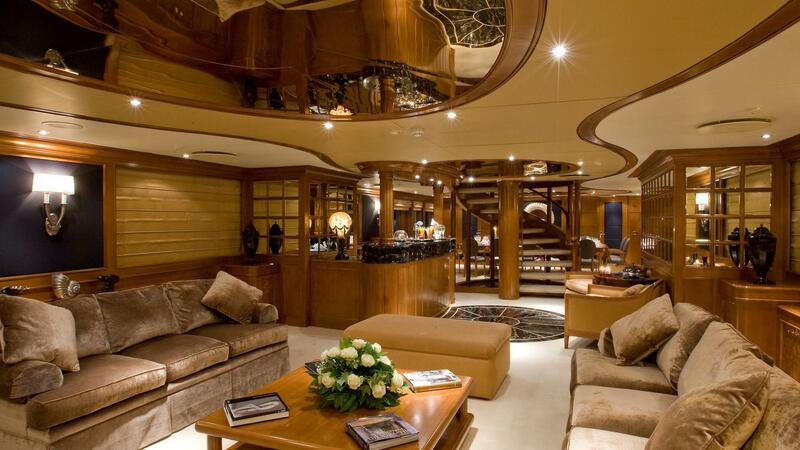 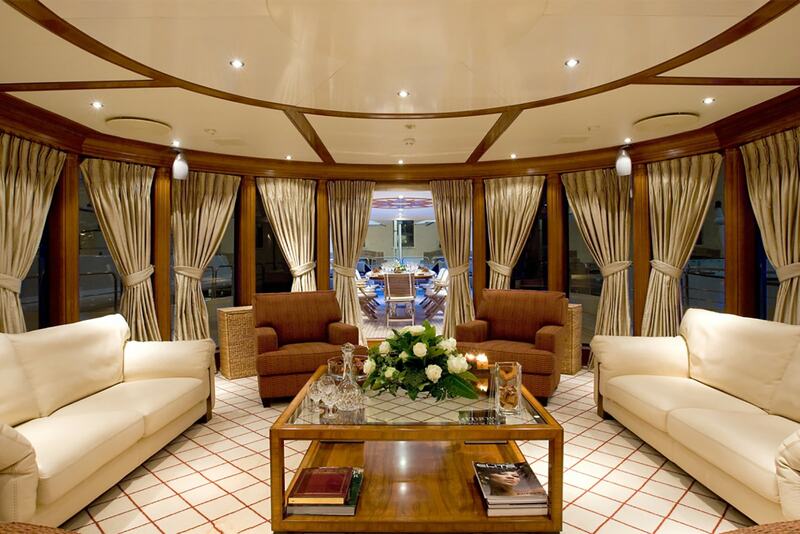 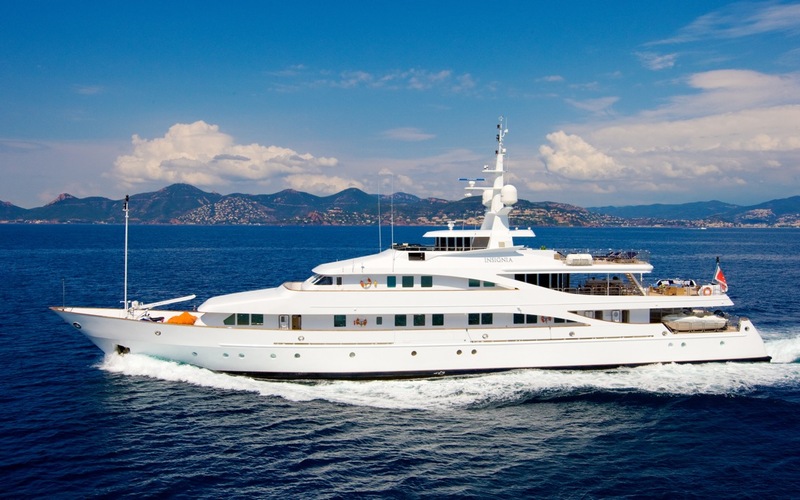 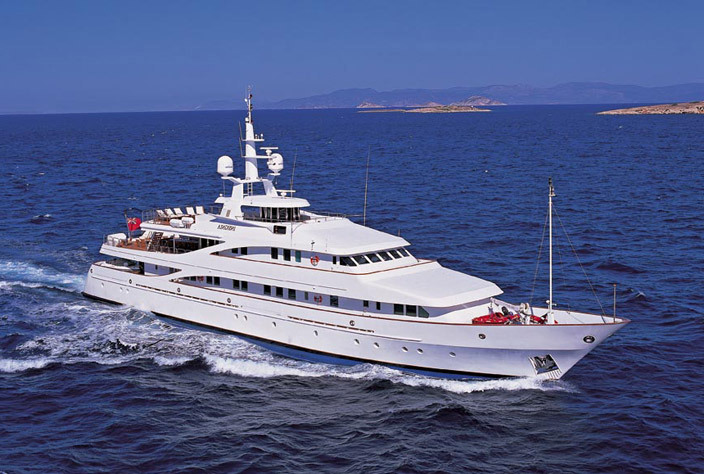 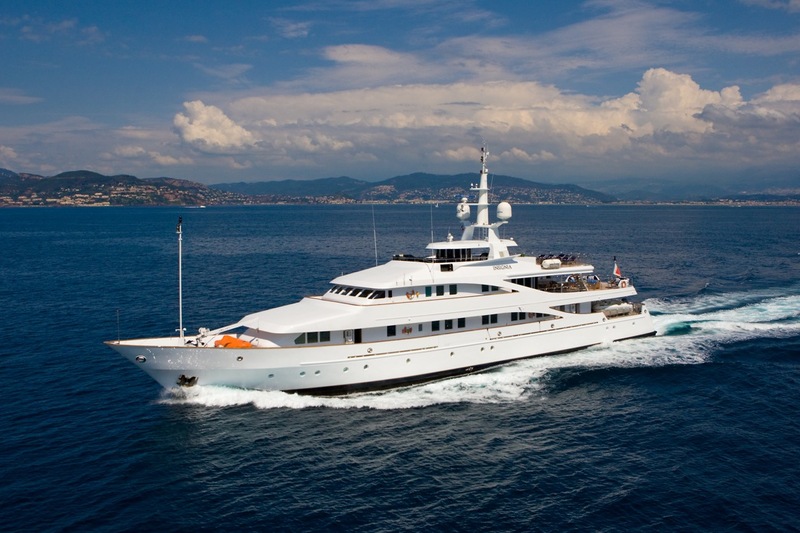 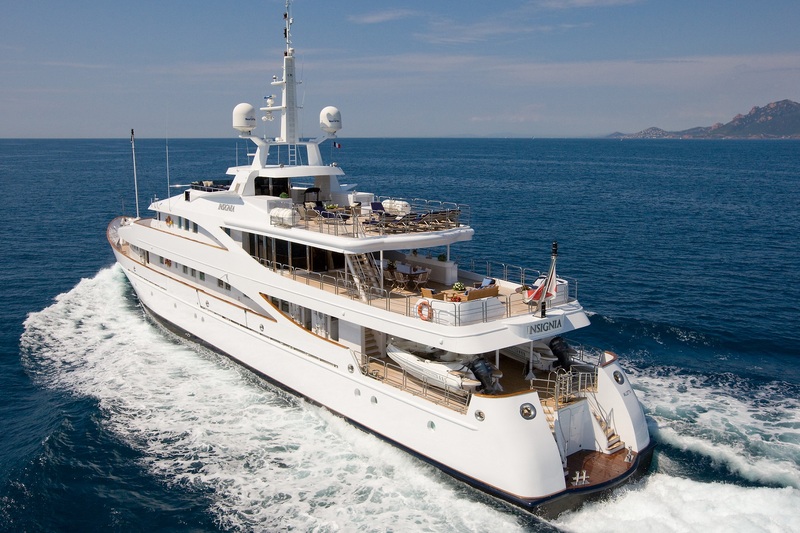 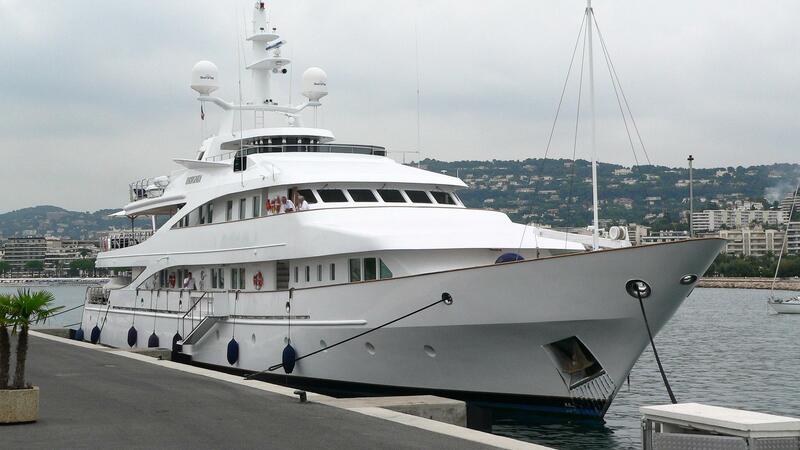 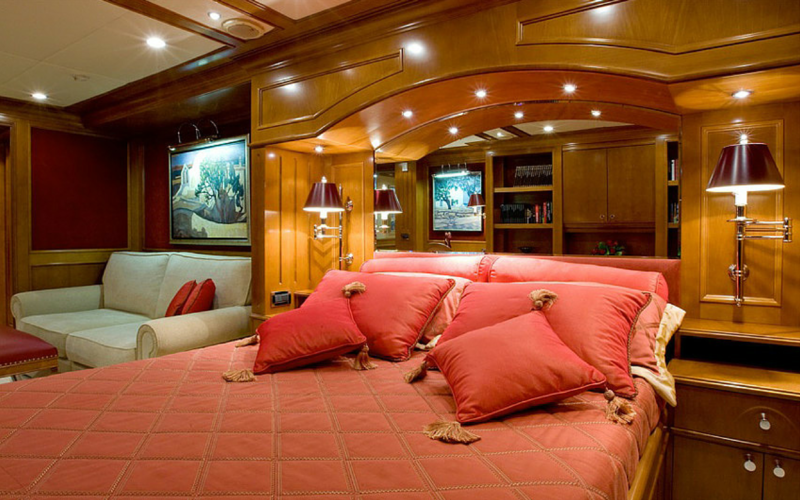 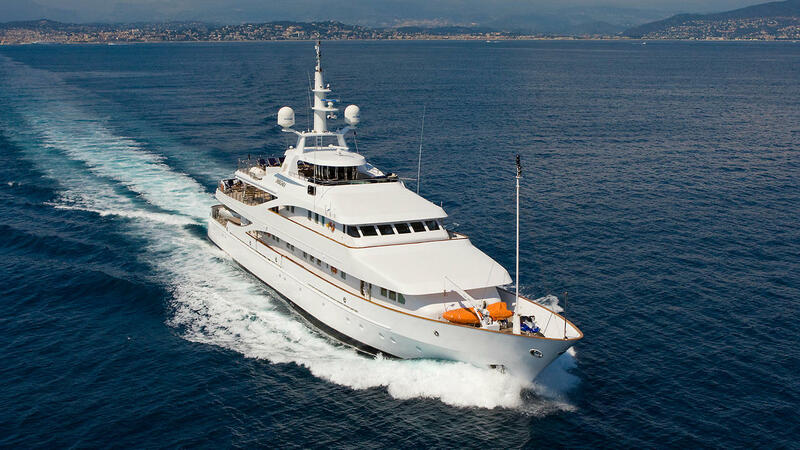 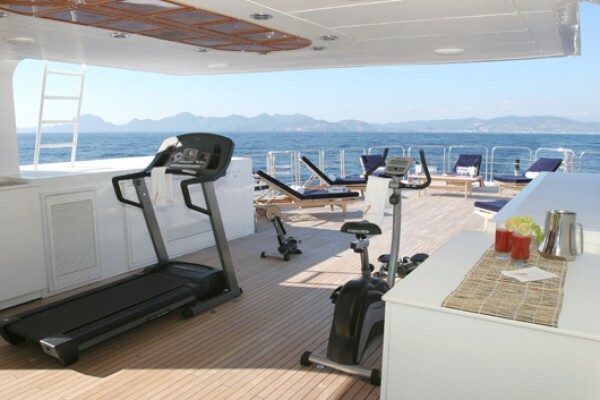 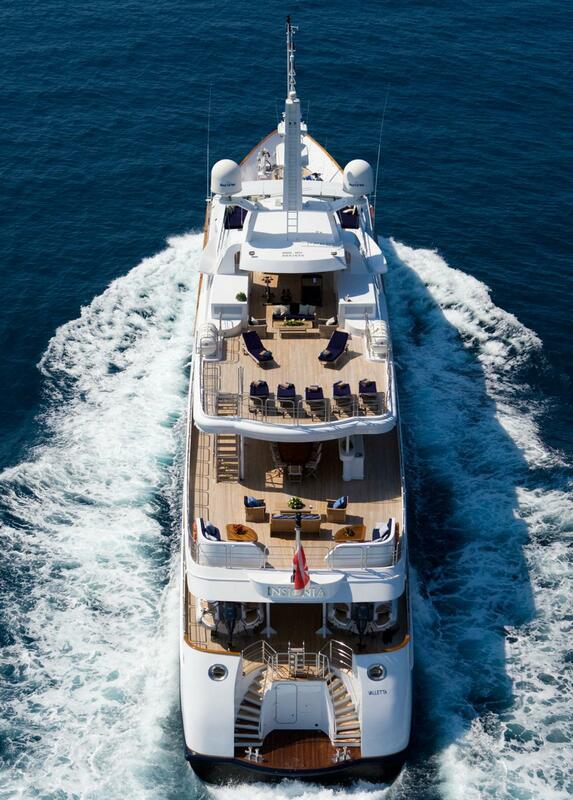 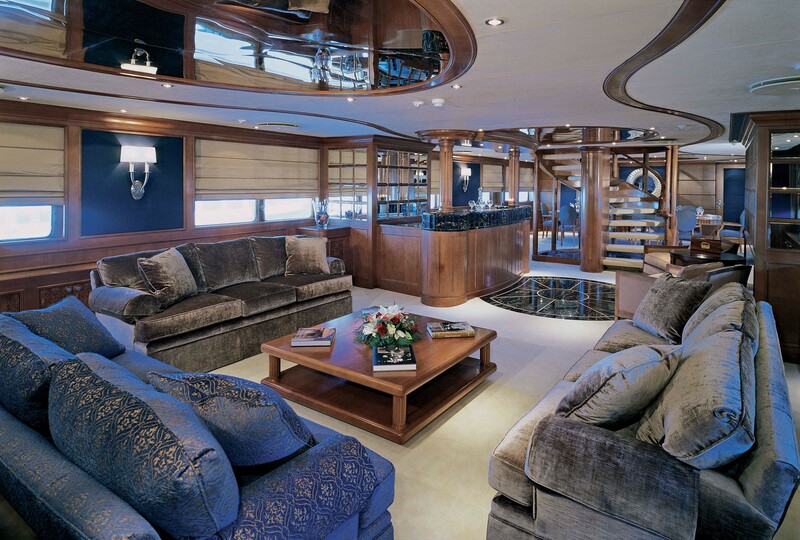 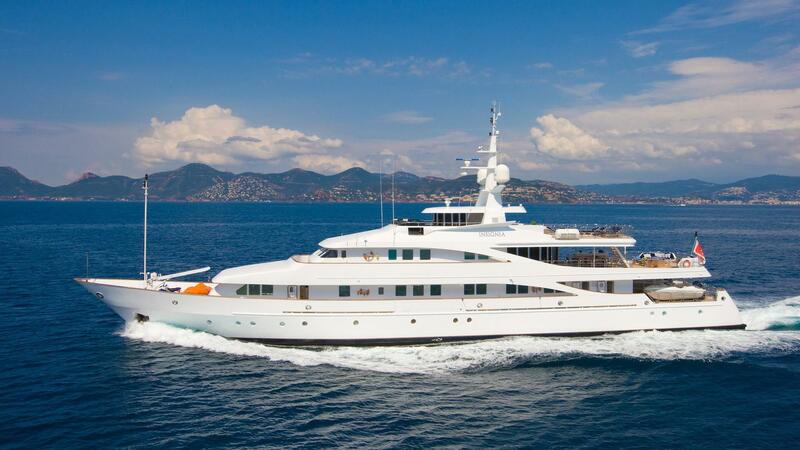 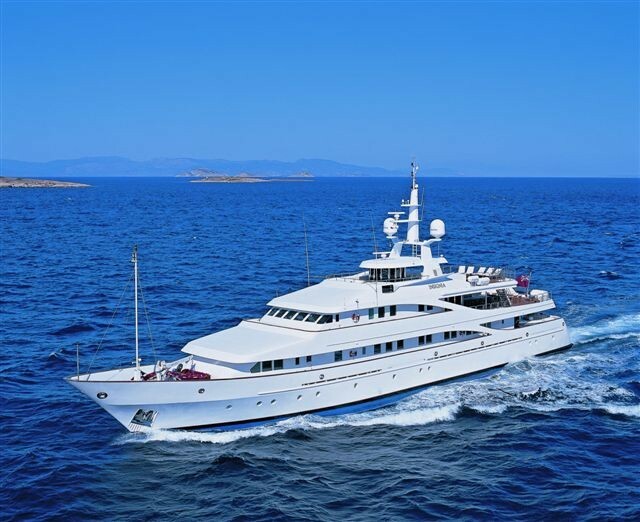 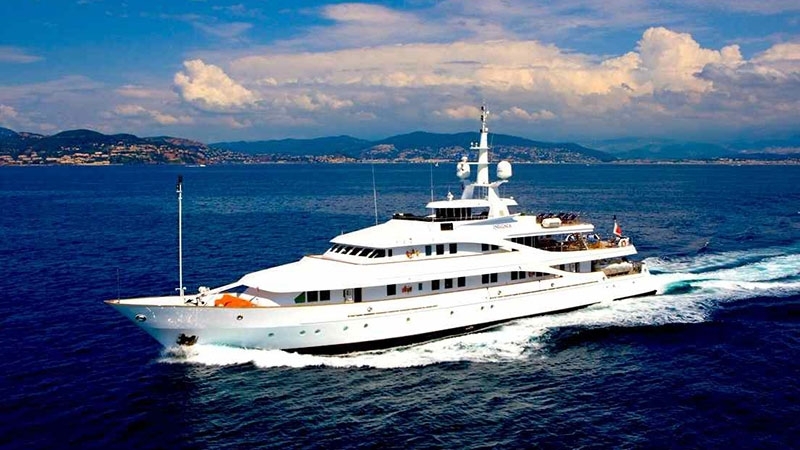 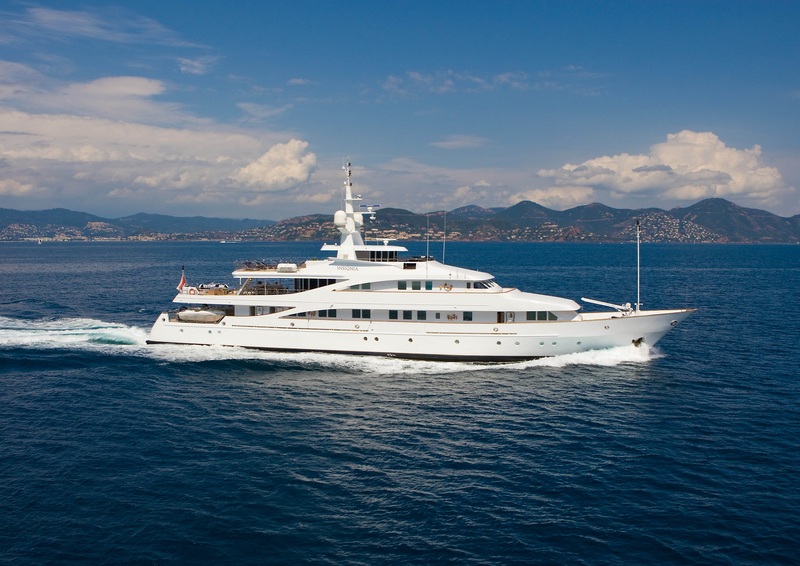 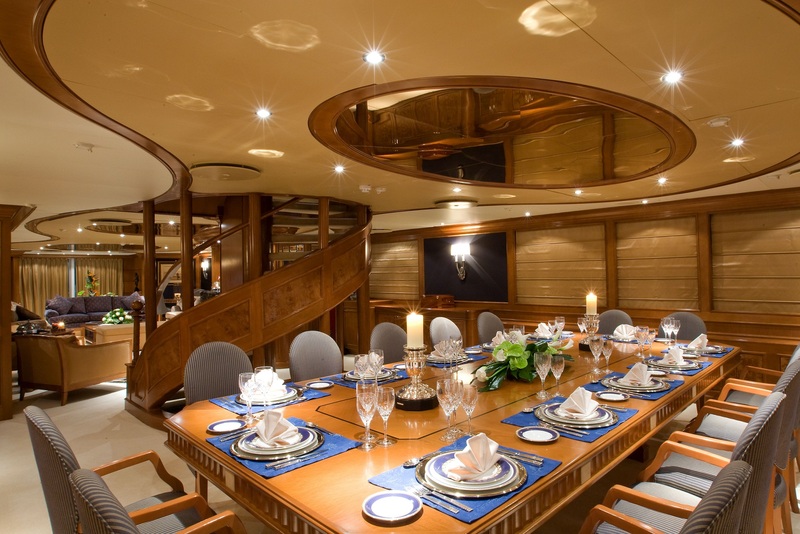 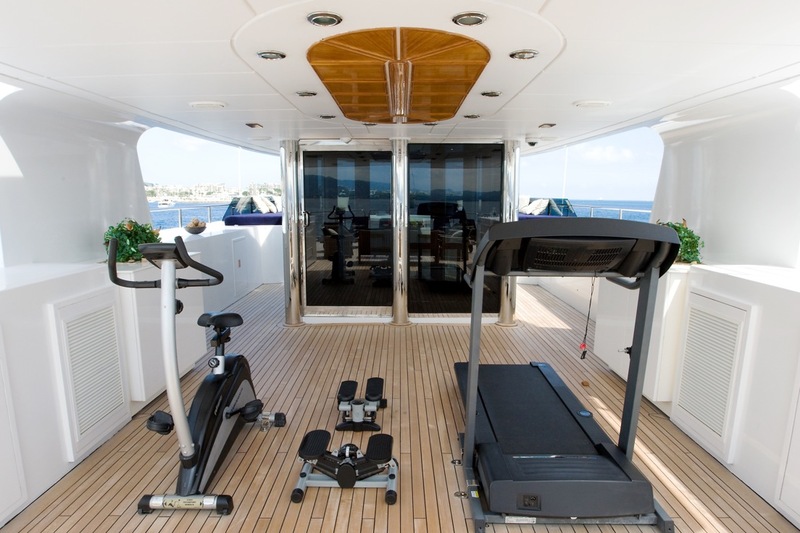 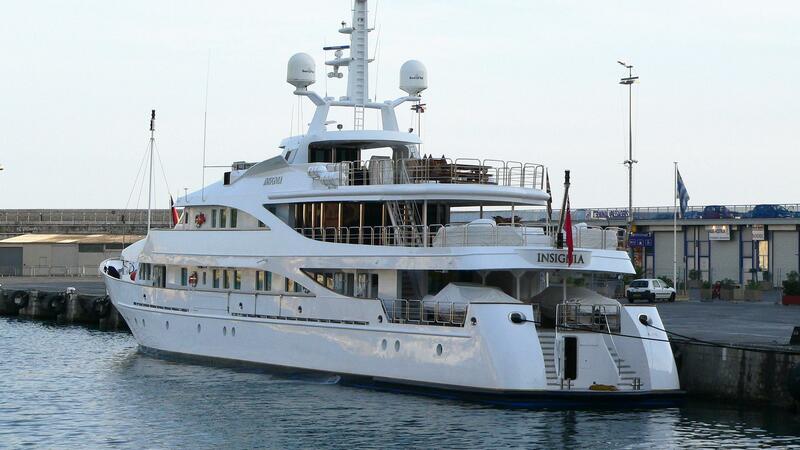 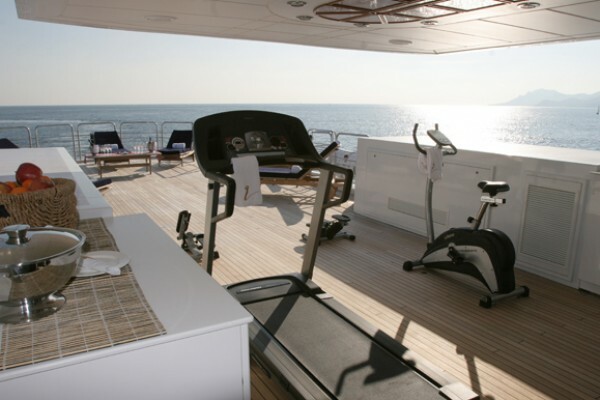 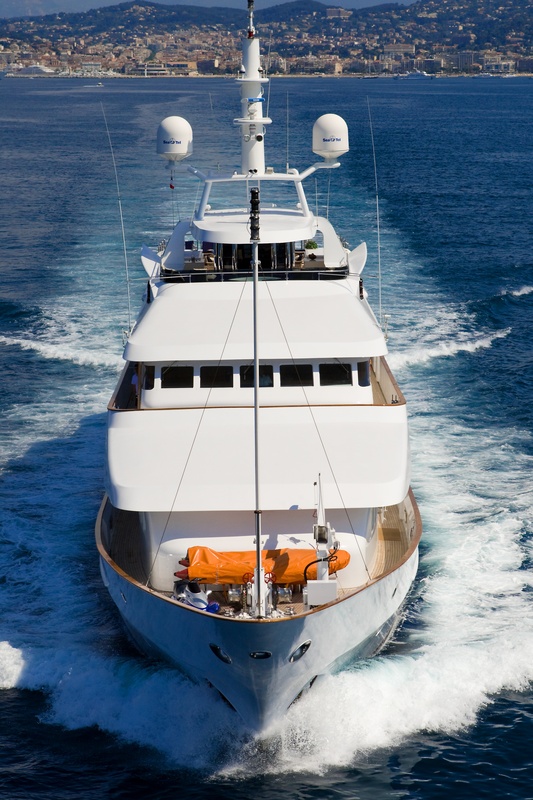 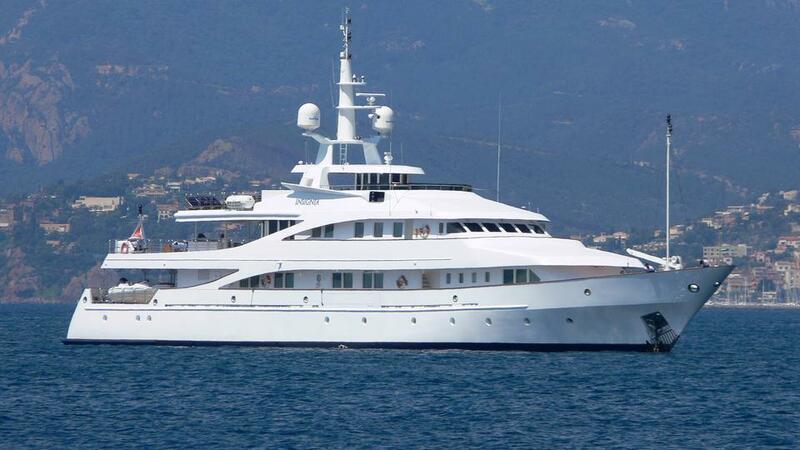 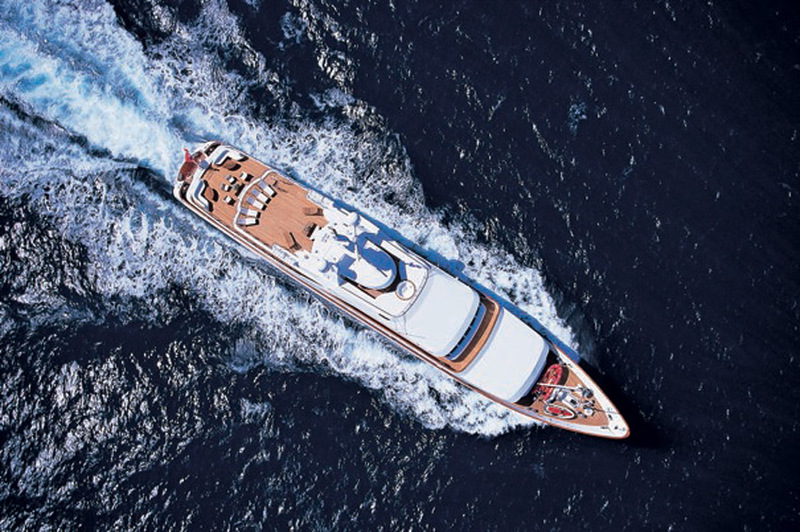 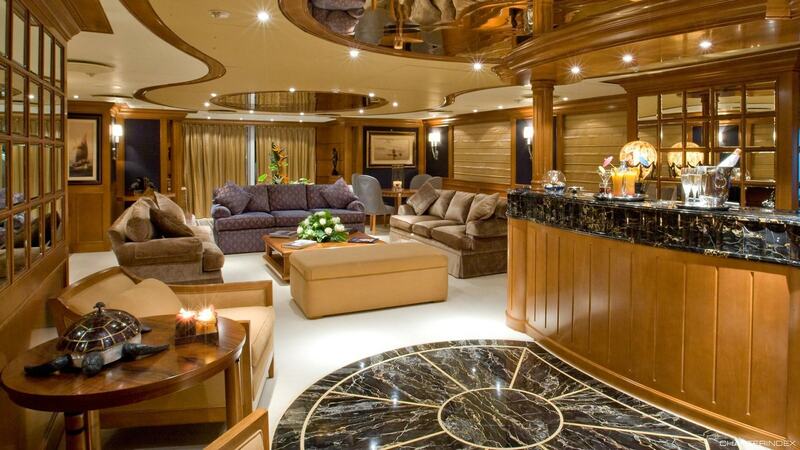 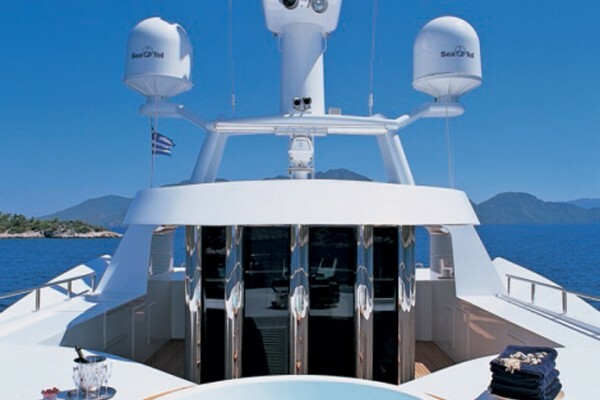 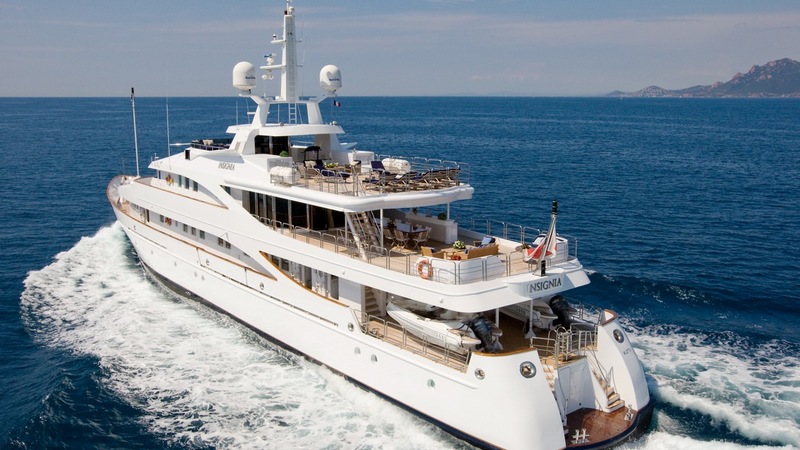 She is now one the most successful chart yacht and offers great accommodation for 12 guests in 7 cabins. 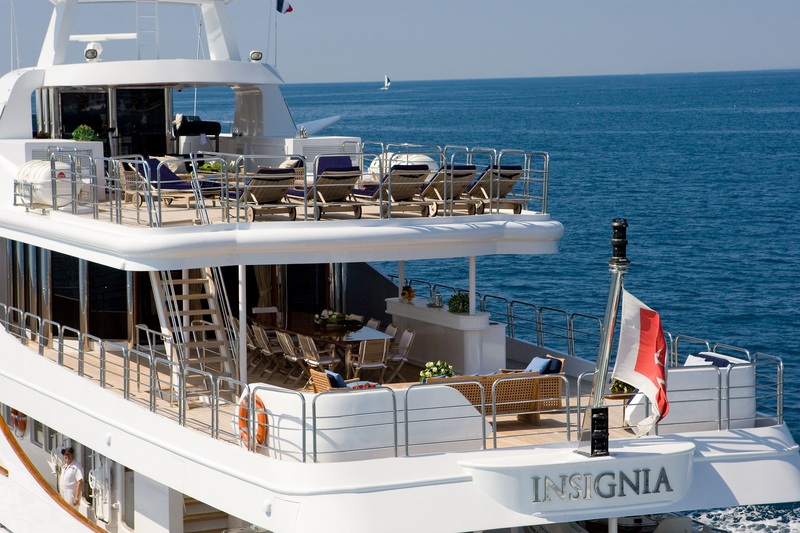 INSIGNIA is a stunning yacht with pedigree, yet she also all features all the modern amenities one would expect from a luxury yacht of this size. 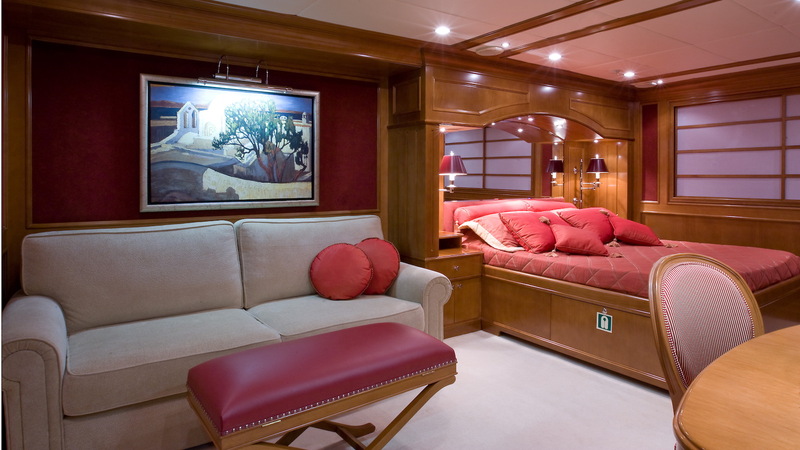 Her size also allows for very comfortable accommodation for up to 14, while giving spacious common areas both inside and out. 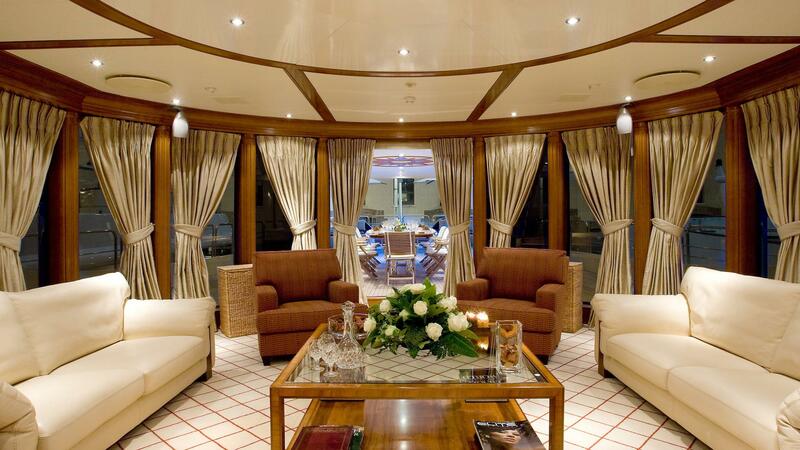 The main salon is very spacious, with elegant and comfortable sofas. 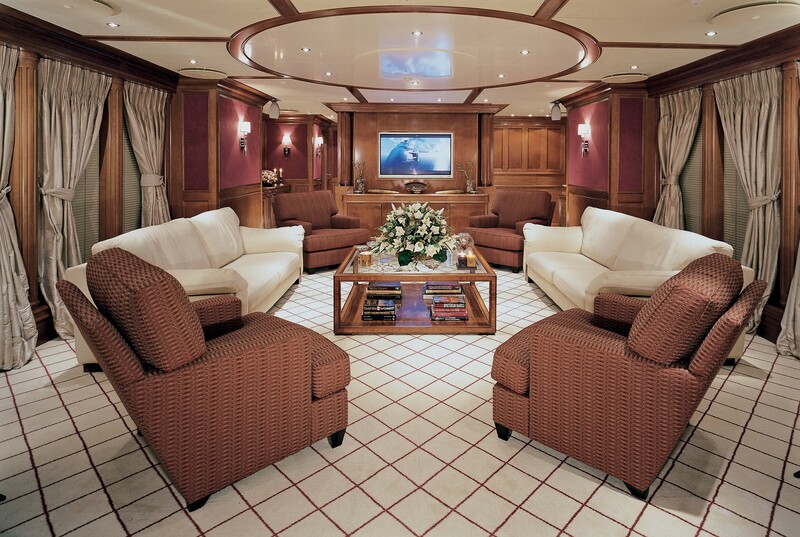 There is an entertainment center with large screen plasma TV/DVD/CD. 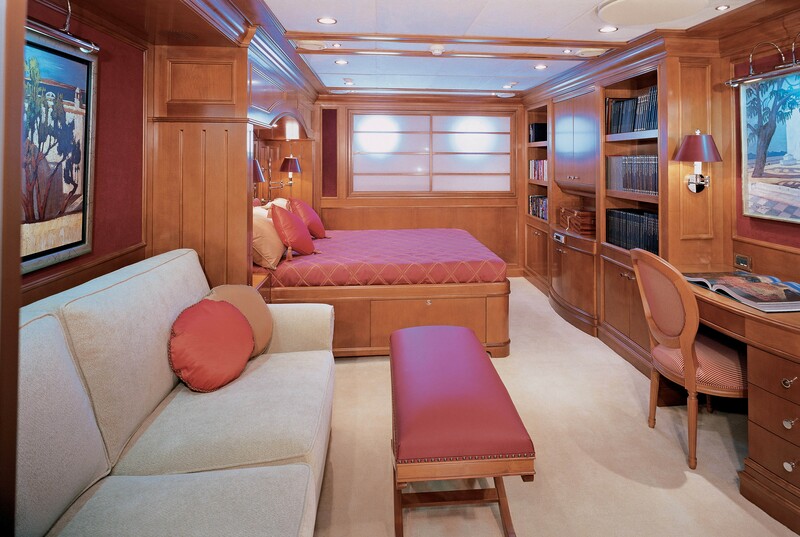 Movie, music & book libraries, board games. 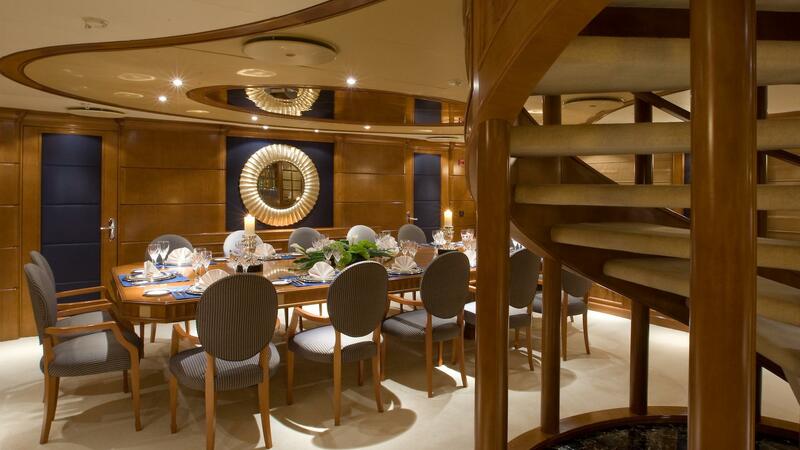 The dining salon is forward, separated from the main salon by a central staircase. 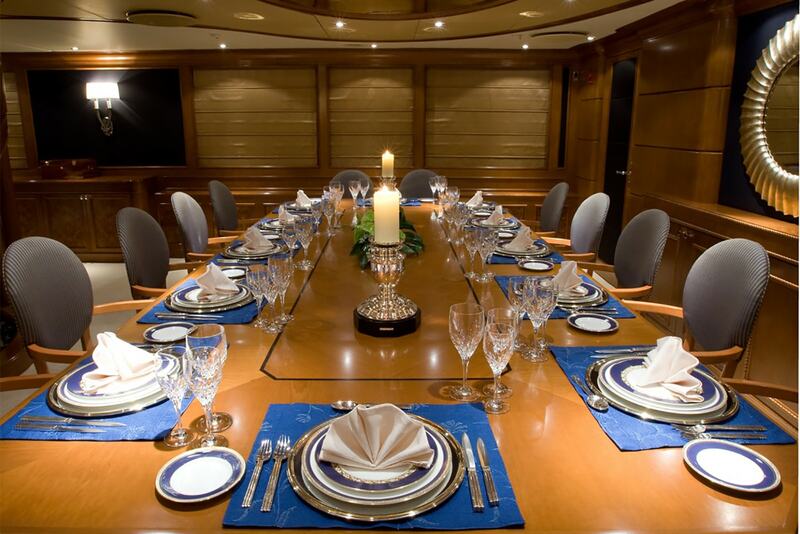 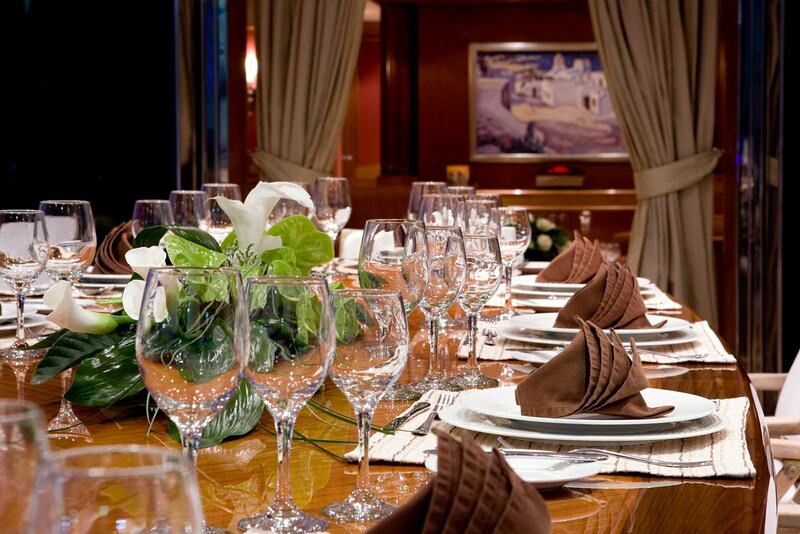 A formal dining setup is for up to 14 guests. 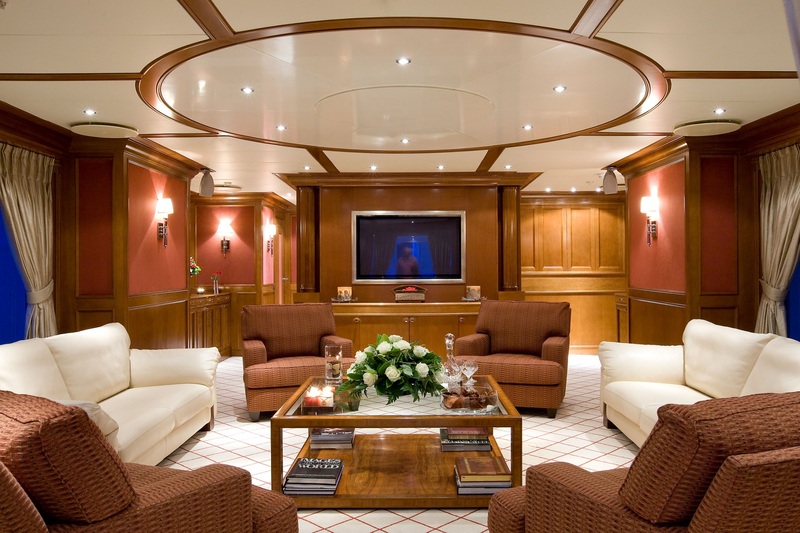 The upper deck hosts a generous lounge with entertainment centre: home cinema with an overhead projector (surround sound). 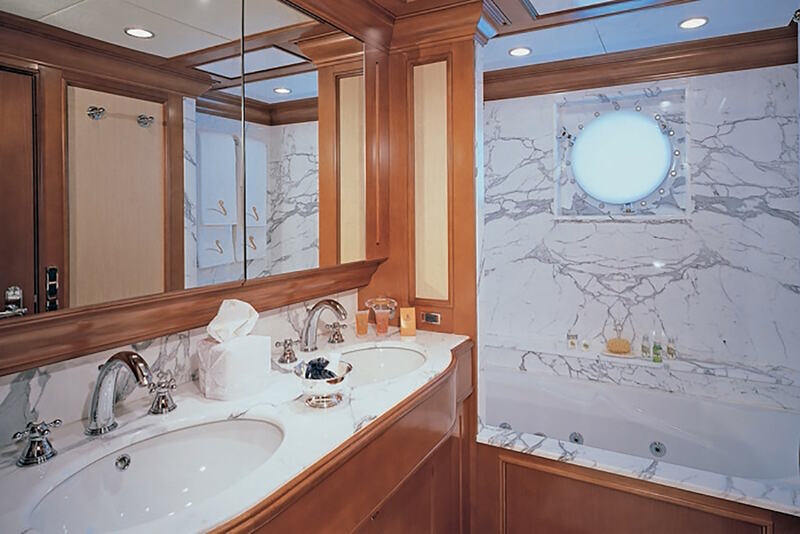 There is a powder room forward on the upper deck. 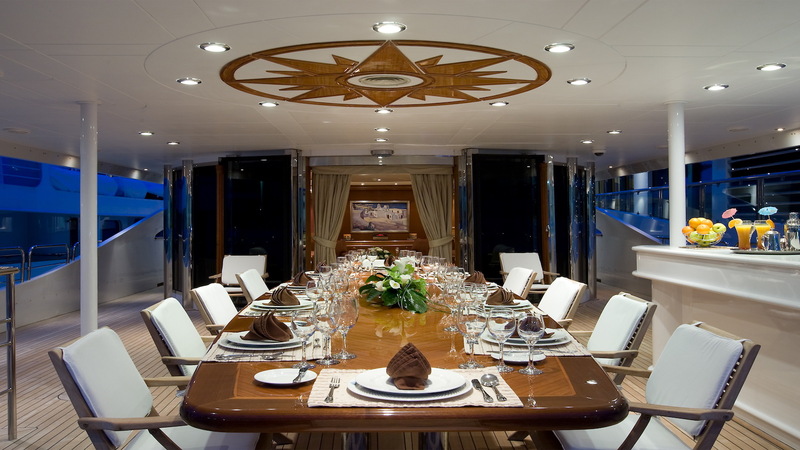 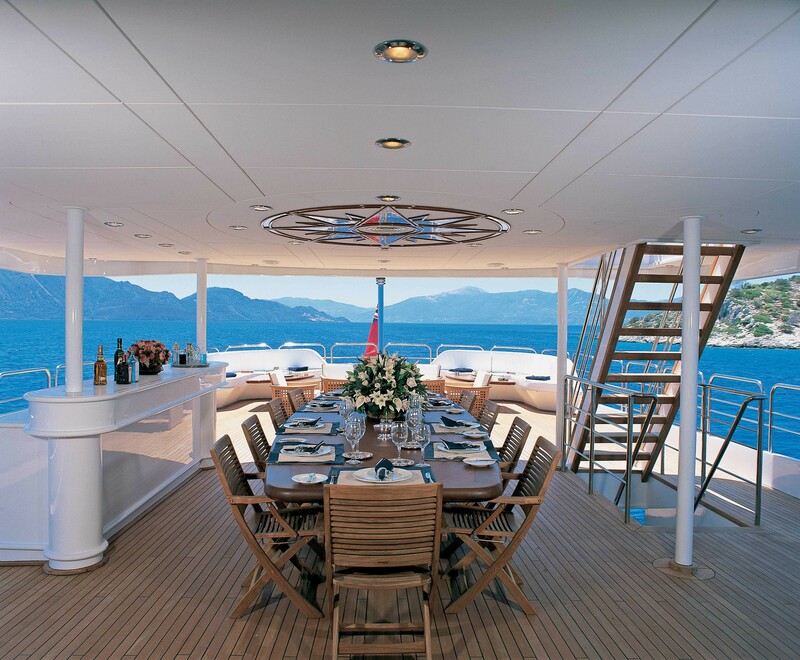 Alfresco dining for up to 14 guests and a wet bar area and a lounge area with ample seating are located on the upper deck aft. 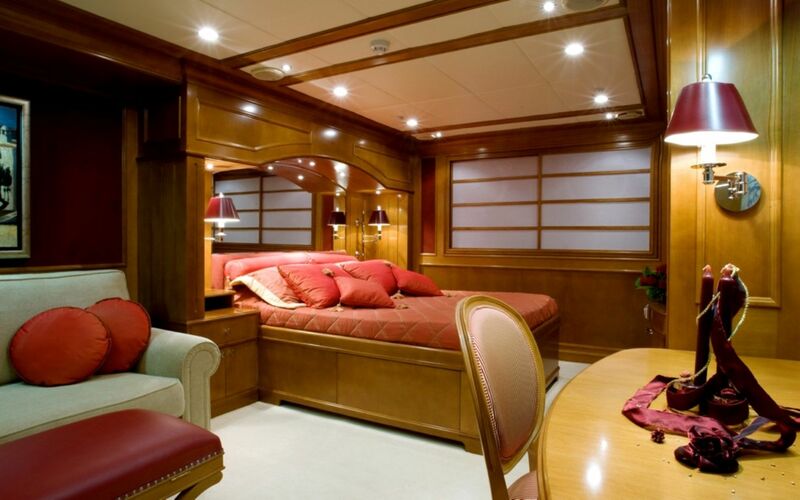 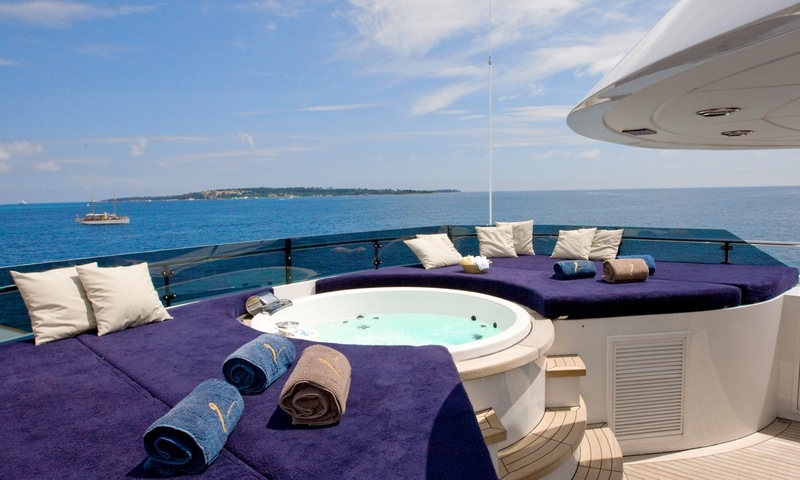 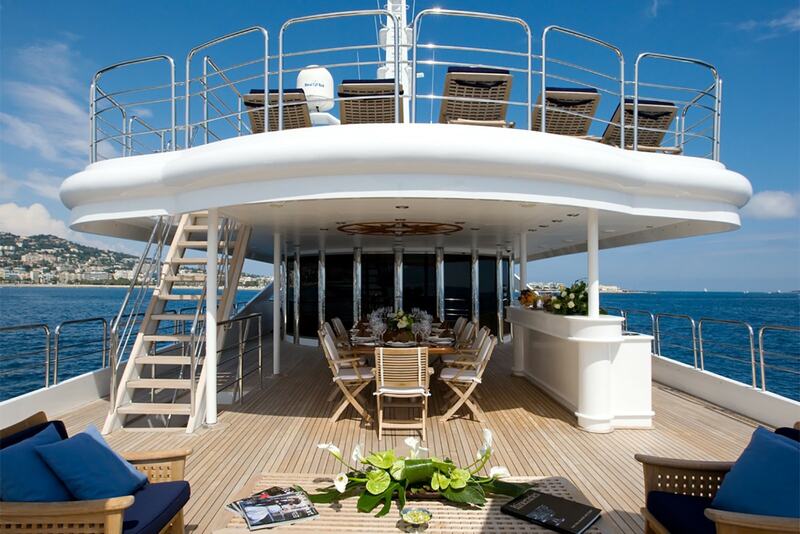 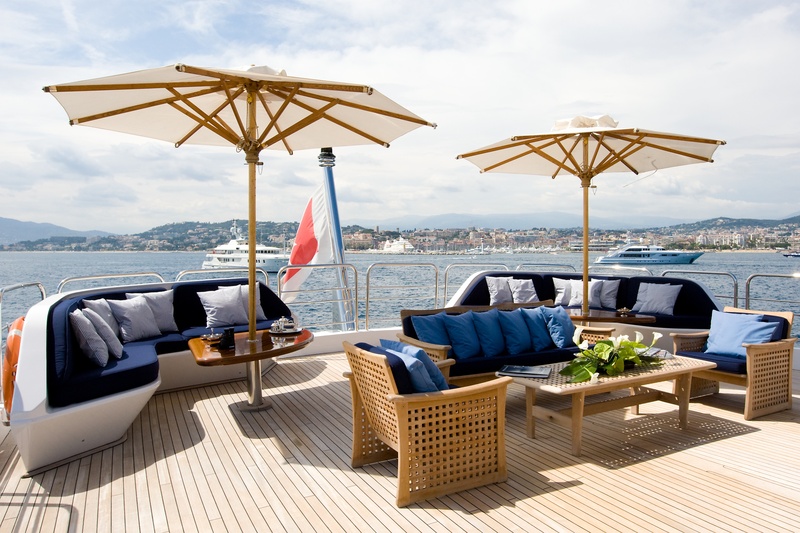 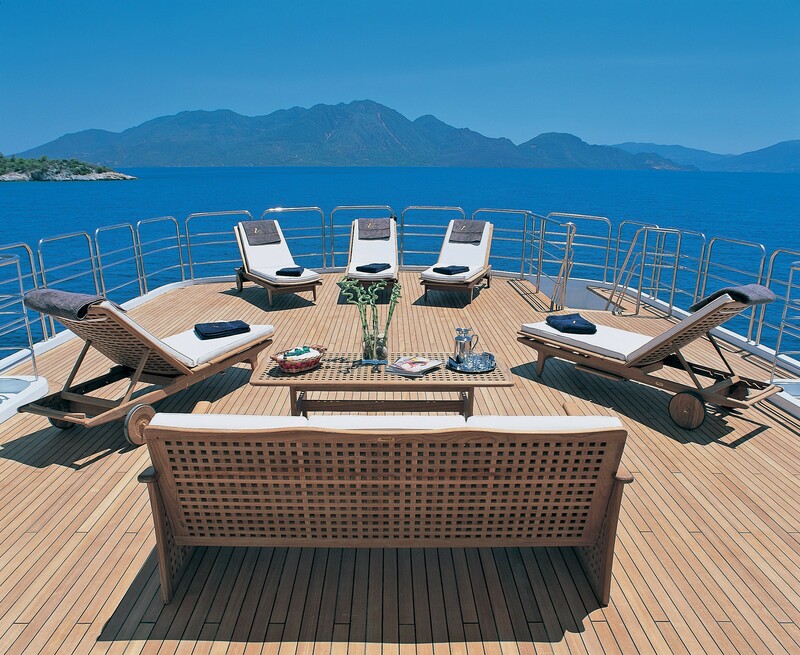 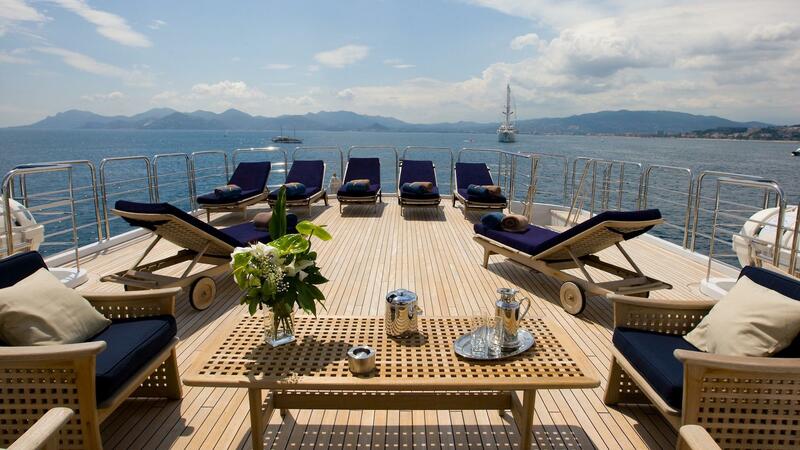 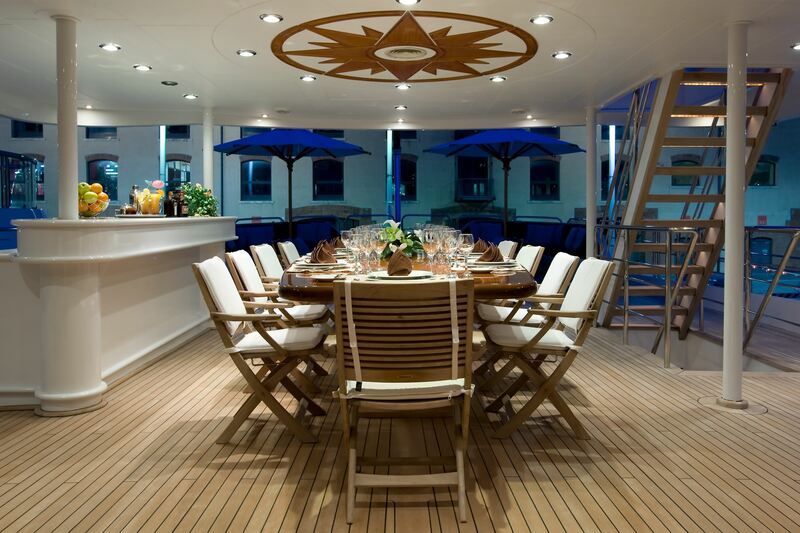 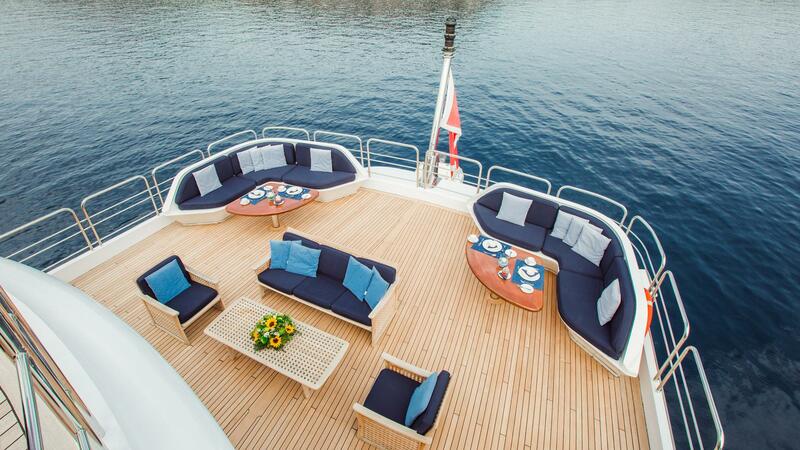 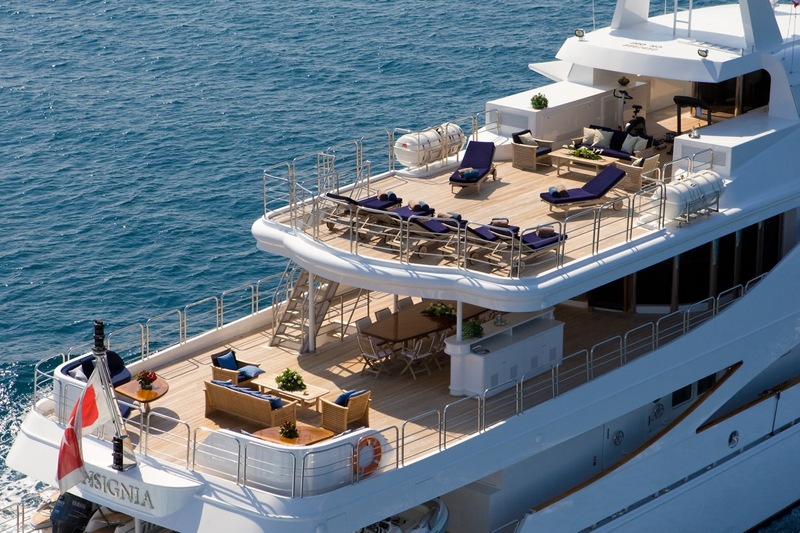 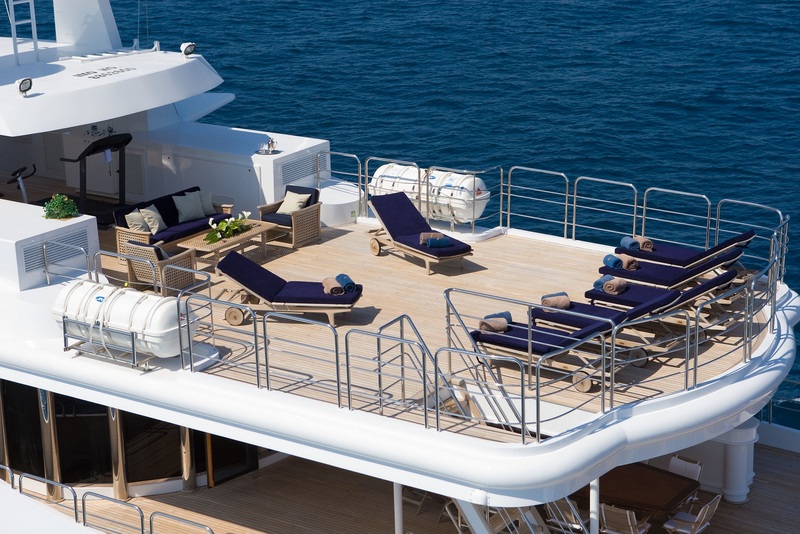 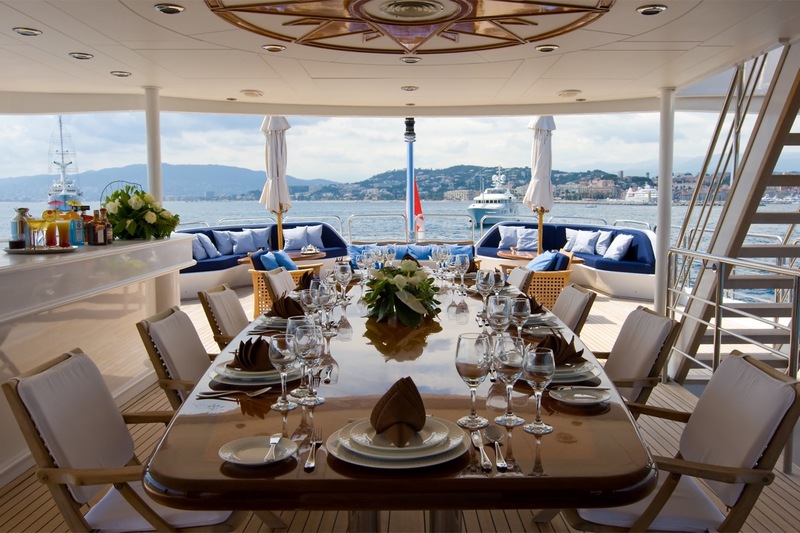 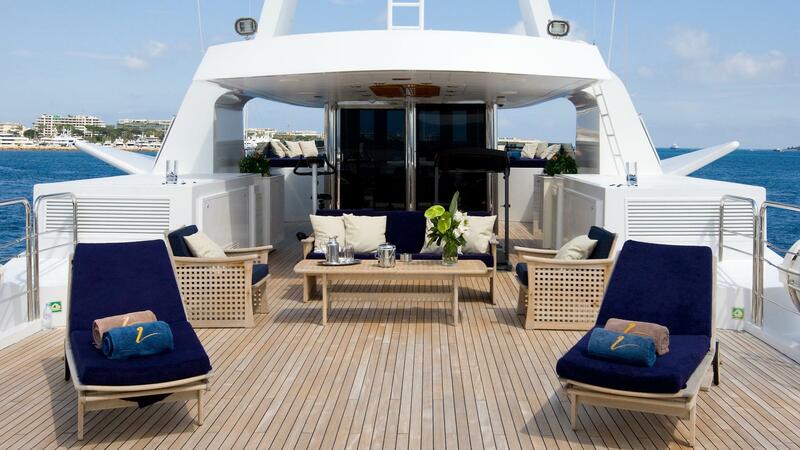 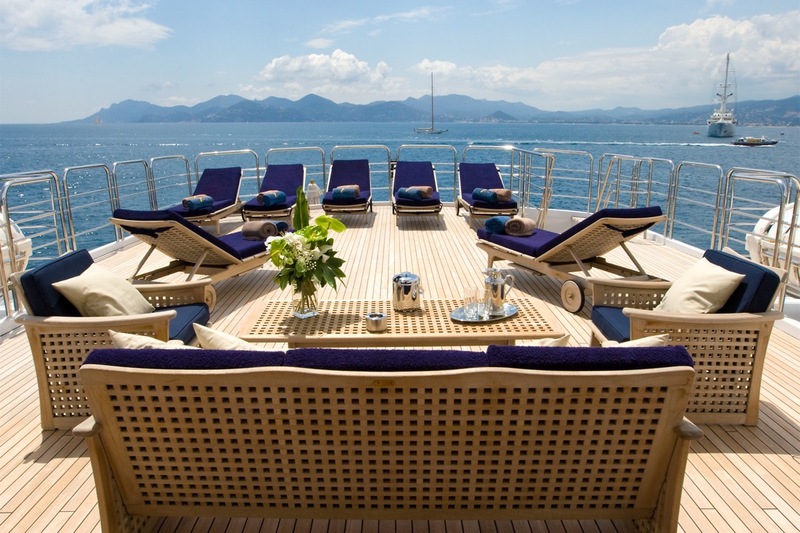 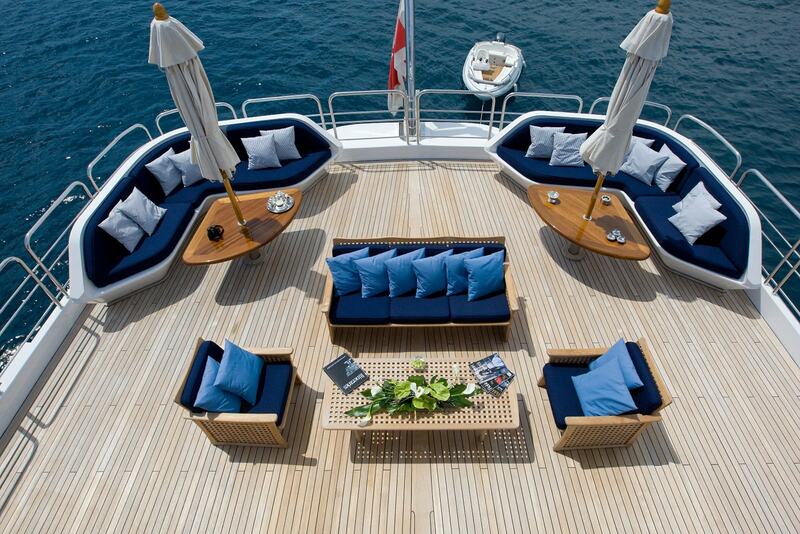 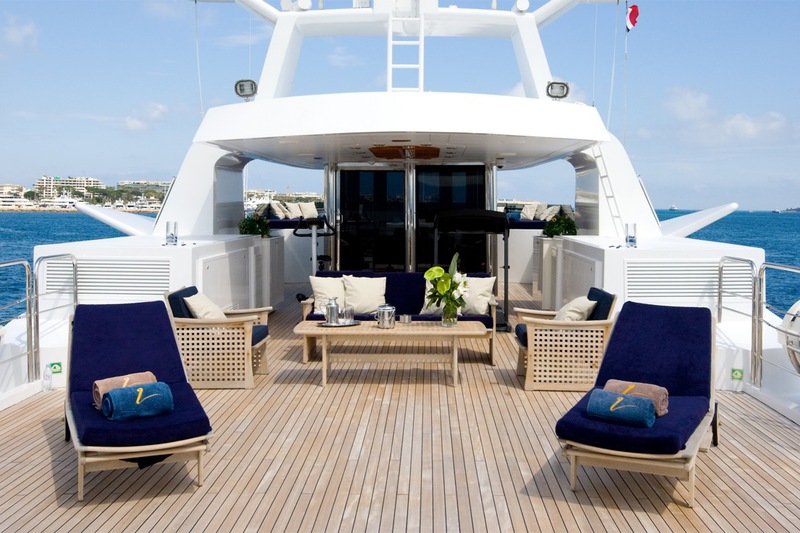 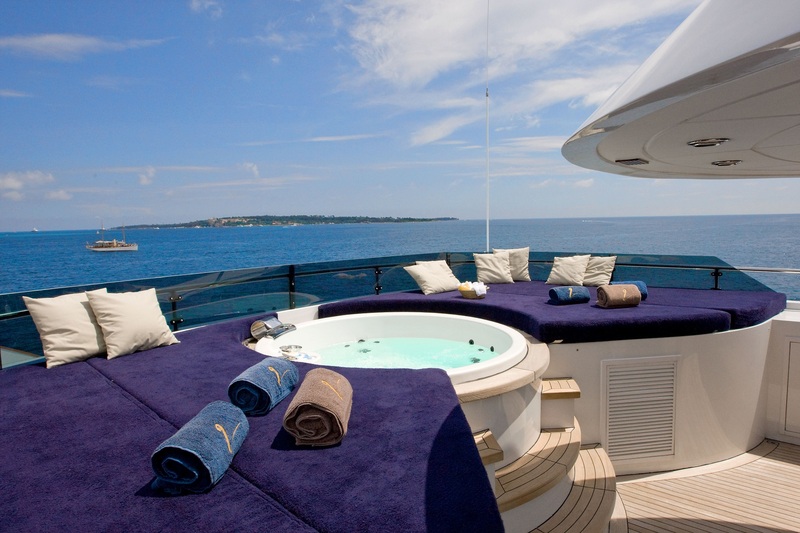 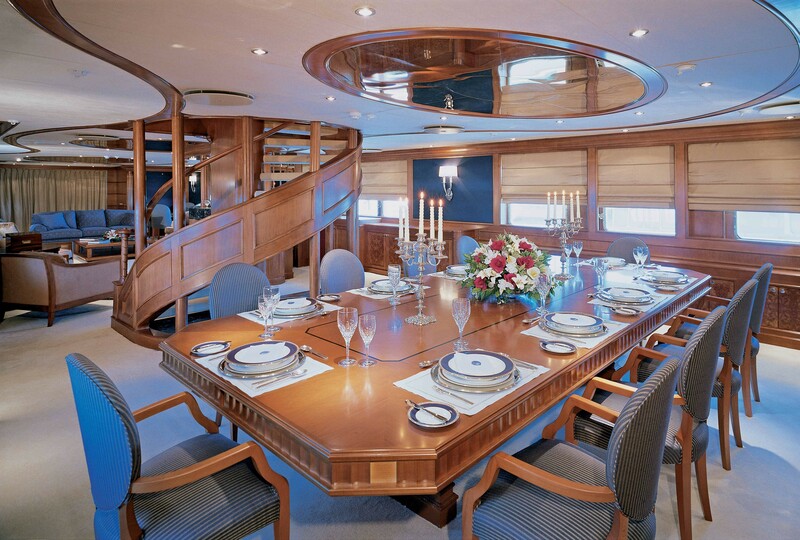 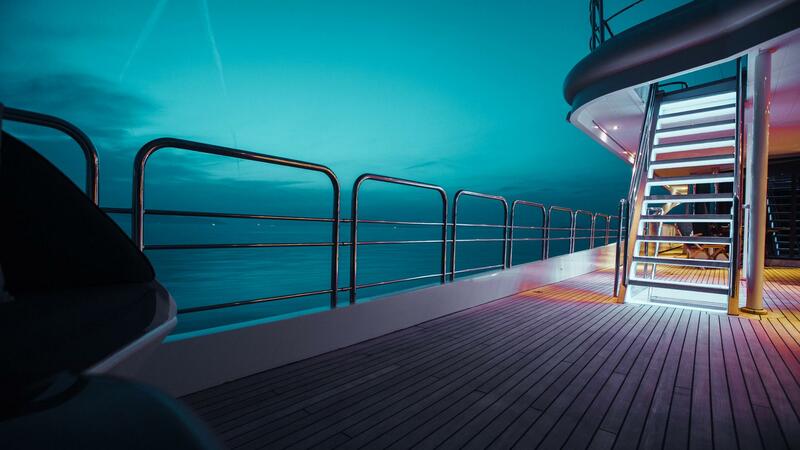 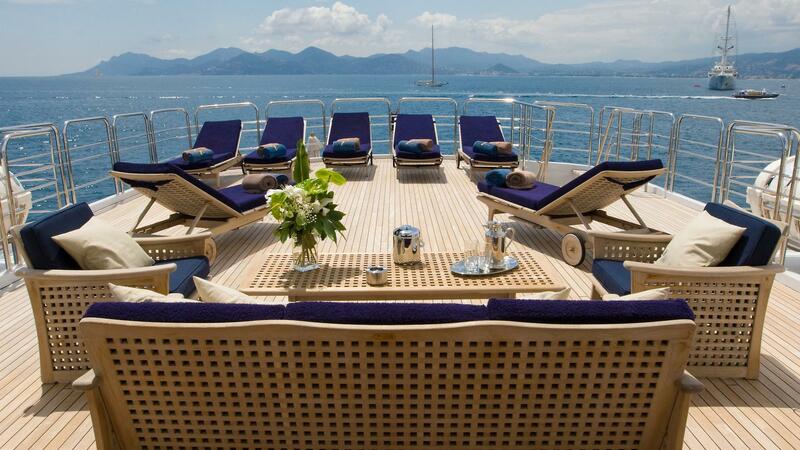 Charter guests will adore the sundeck, ideal for entertaining and relaxing. 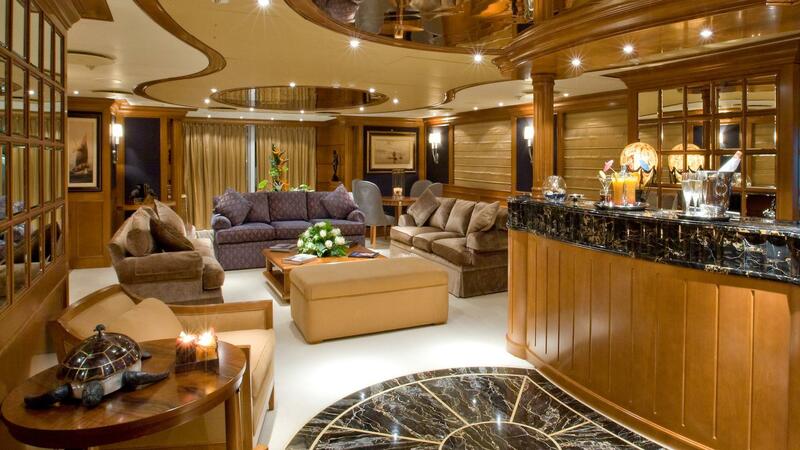 The is a large Spa Pool, nine chaise lounges, grill, wet bar, and gym equipment. 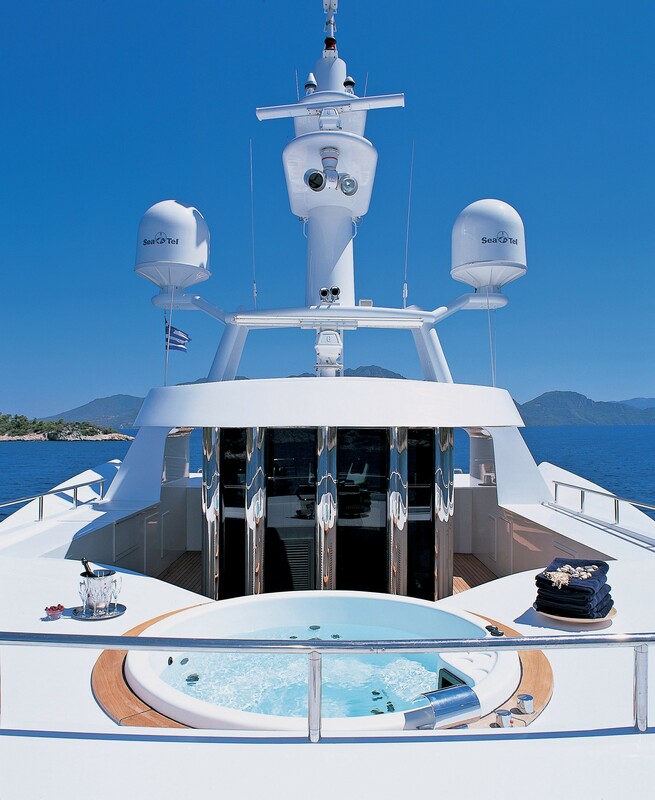 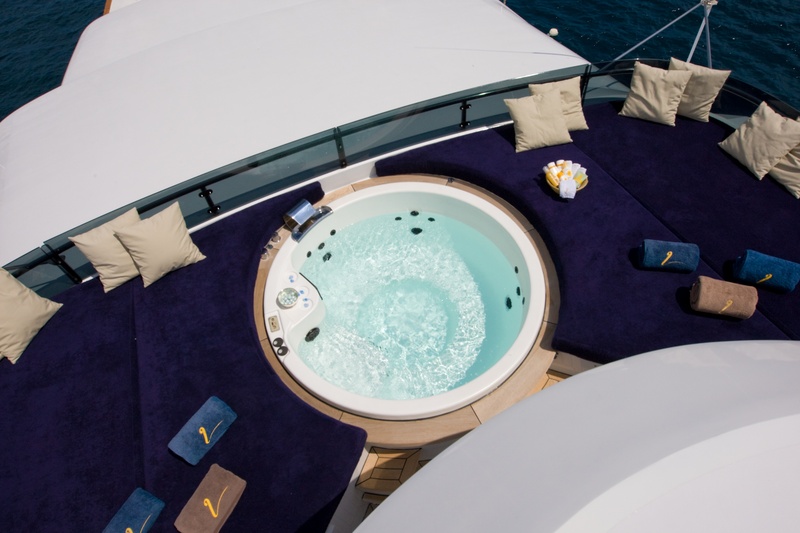 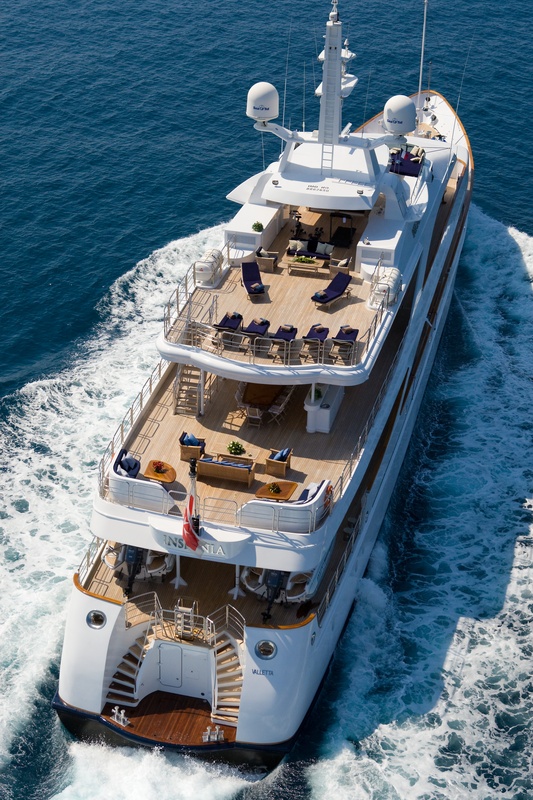 INSIGNIA's vast selection of water toys will add some extra fun to a charter vacation, while a professional crew of 13 will attend 12 guests and ensure the highest standard of services. 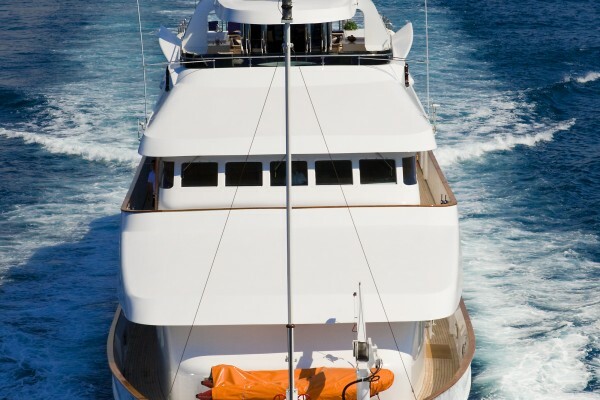 Powered by 2 x MTU 12V652 engines, she is capable of reaching a top speed of 17 knots, and cruises comfortably at 12 knots. 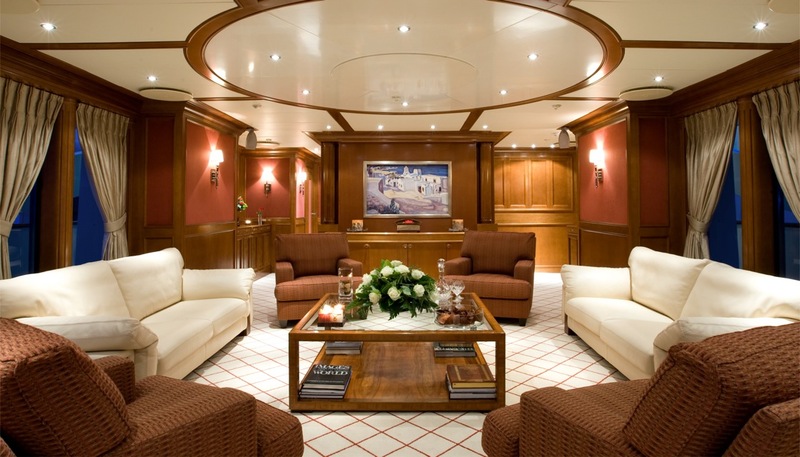 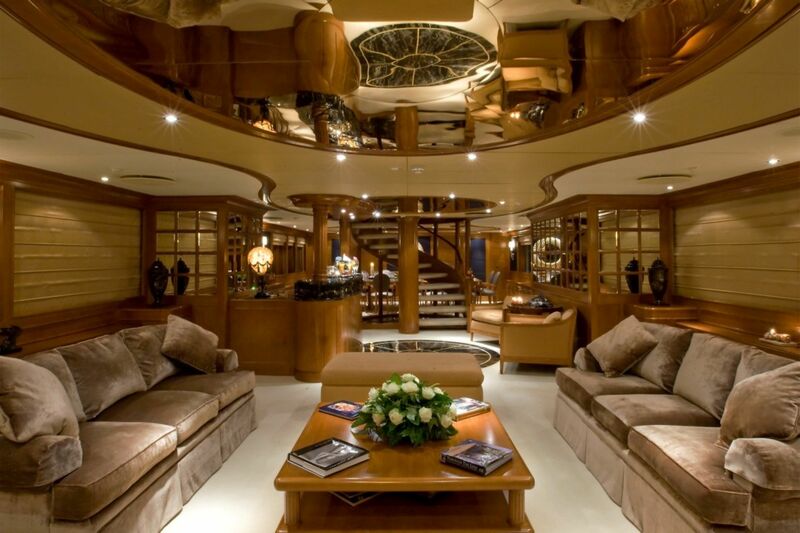 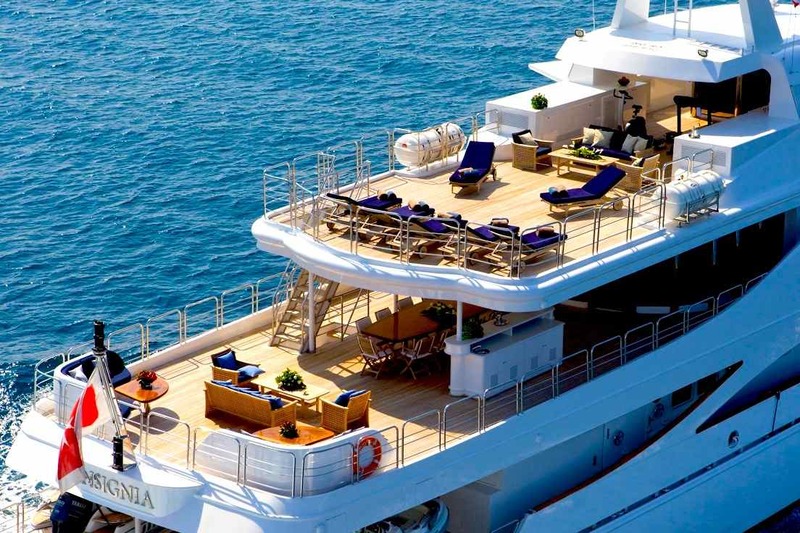 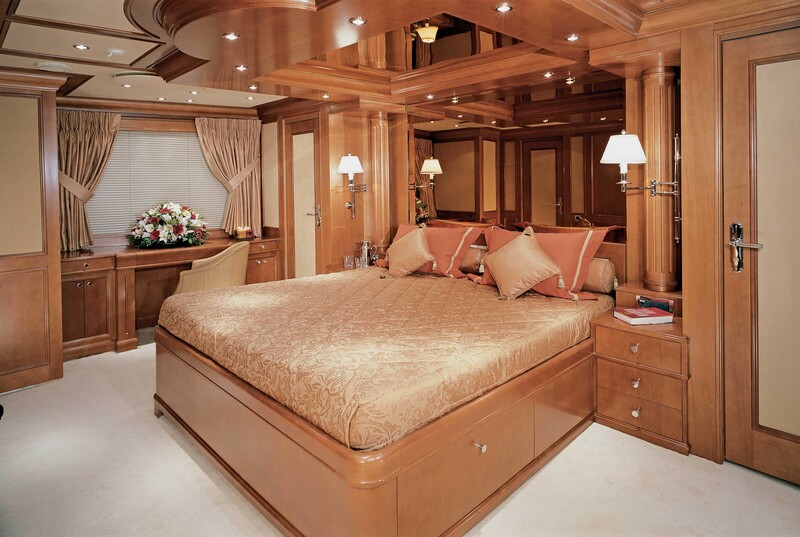 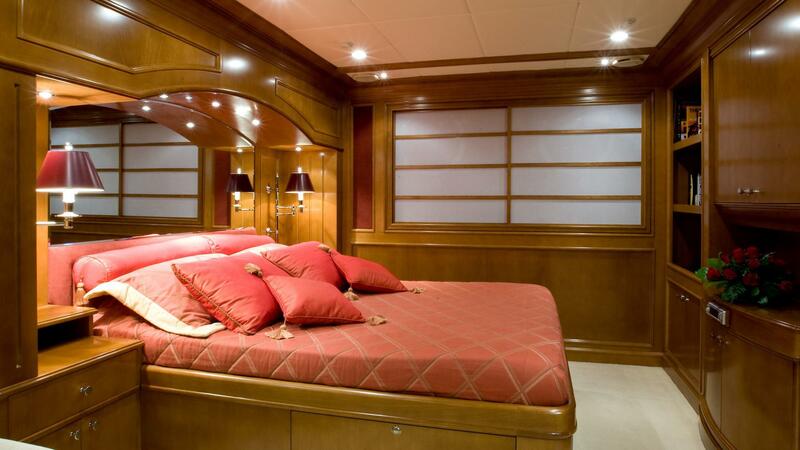 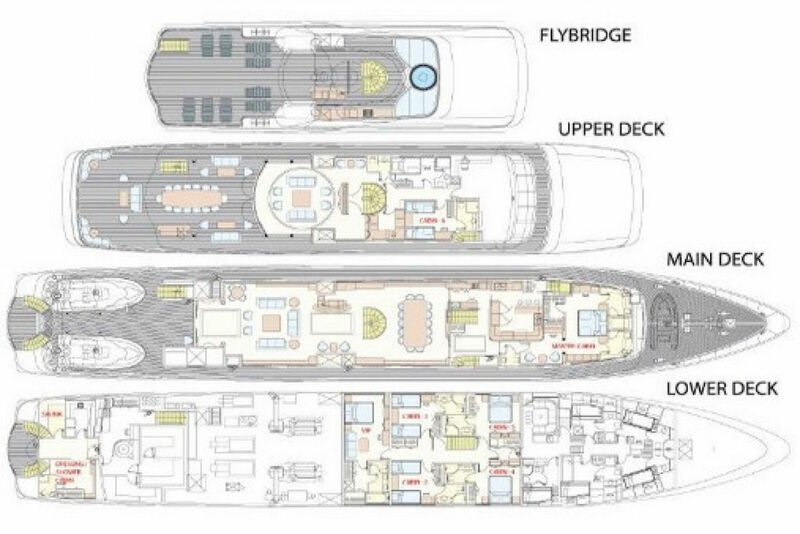 Luxury yacht INSIGNIA may be chartered to accommodate up to 12 guests in 7 cabins in the following layout: Master suite, VIP stateroom, one double and three twins. 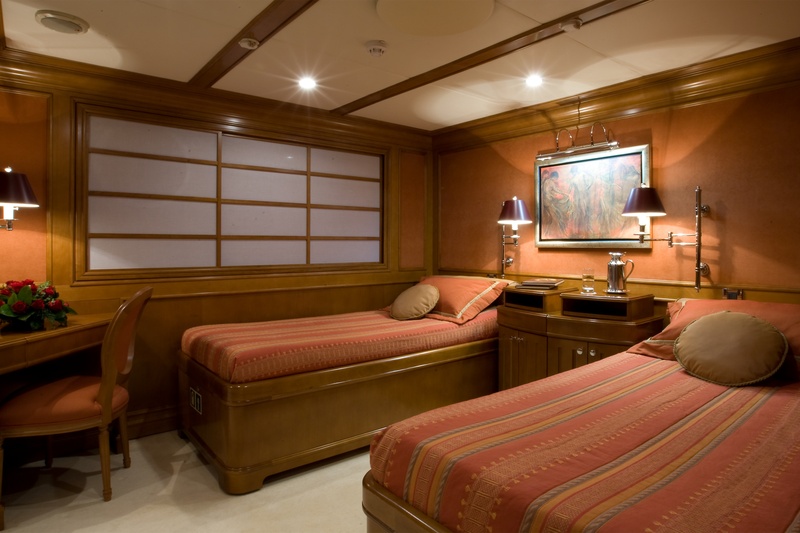 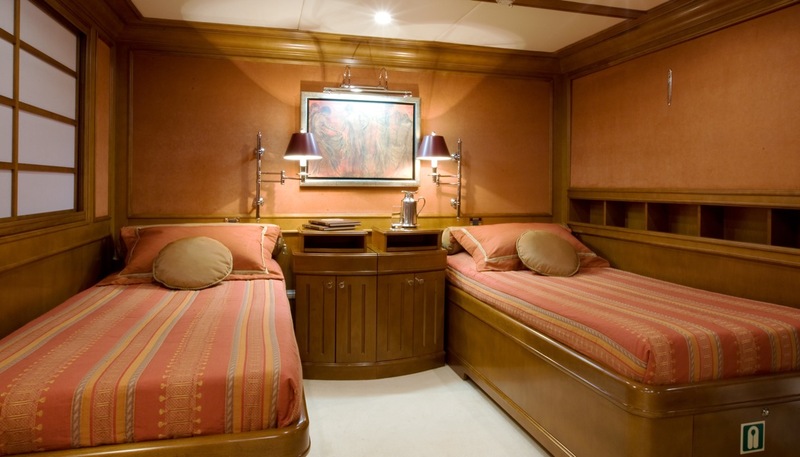 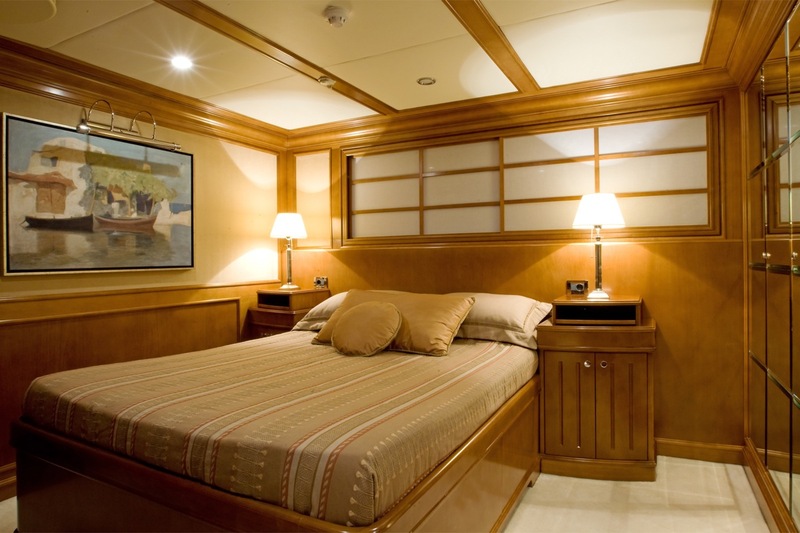 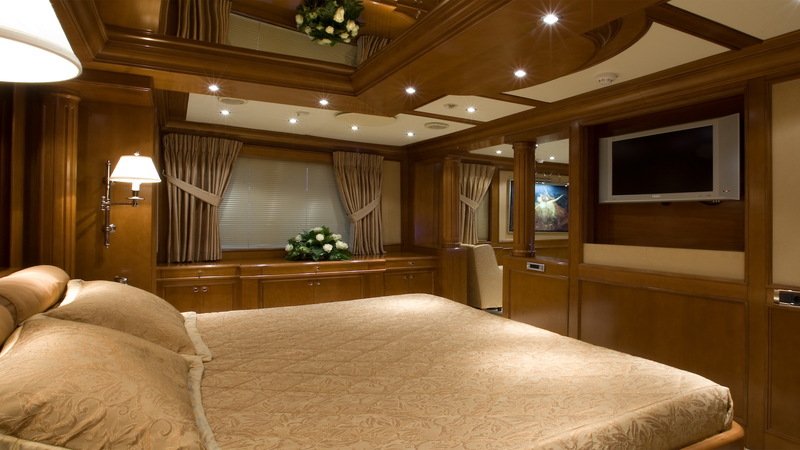 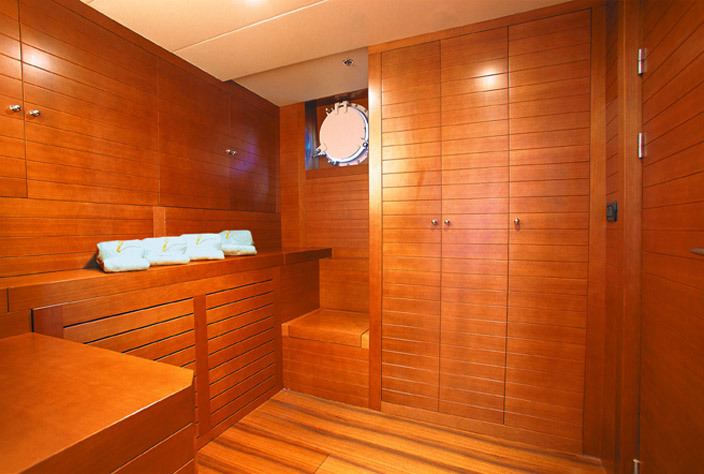 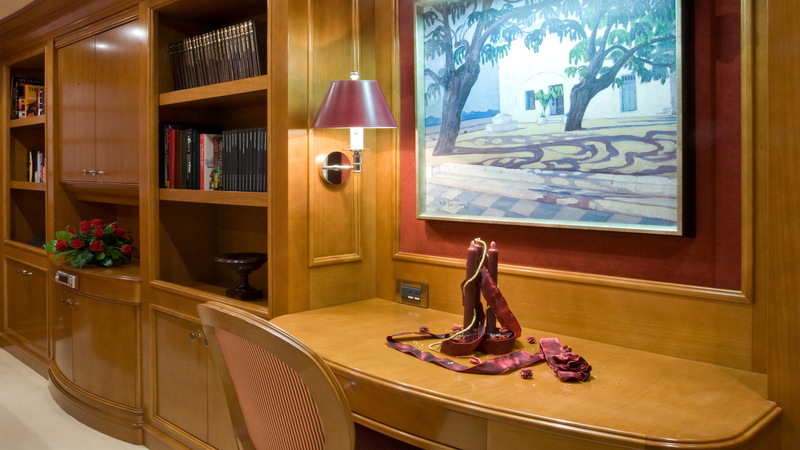 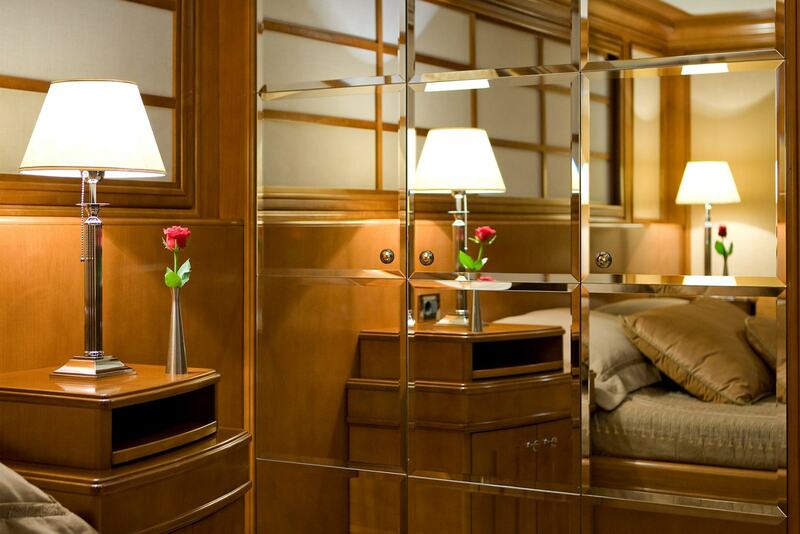 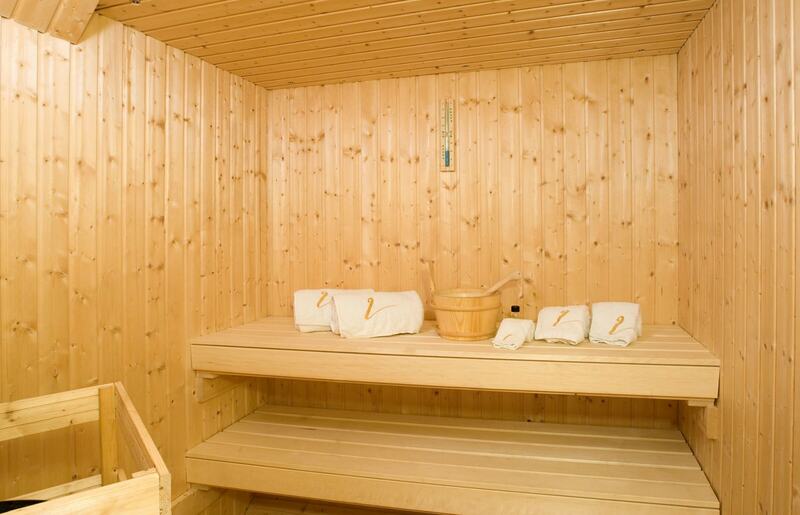 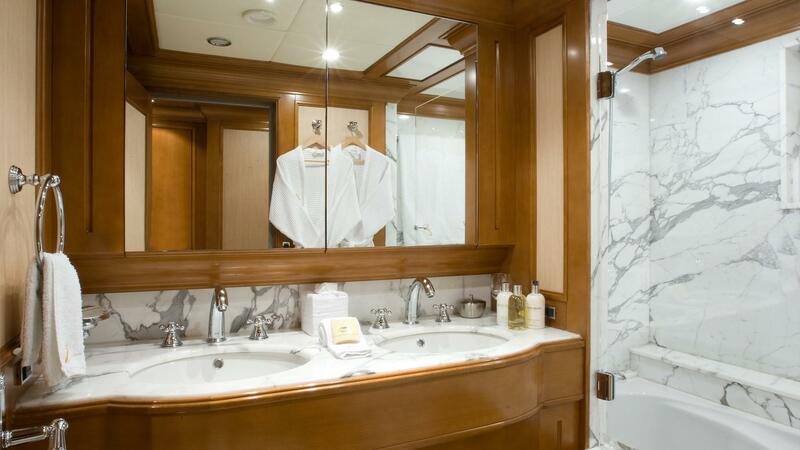 Each stateroom has an ensuite and is equipped with satellite TV/DVD/CD, computer connections, safe.